Harry S. Truman, (1884–1972) a liberal Democrat from Missouri, was the president of the United States from 1945–1953, taking over when Franklin D. Roosevelt died in April 1945. He made the decision to drop atomic bombs on Hiroshima and Nagasaki in order to force Japan's surrender. Angered at the Soviet Union's seizure of eastern Europe, he moved away from FDR's détente to a policy of containment, reinforced by the Truman Plan (1947) to resist Communist subversion, the Marshall Plan (1948–51) to rebuild and modernize western Europe's economies, and the NATO military alliance of 1949. Truman, advised by Dean Acheson and the State Department, set the policies to oppose the Soviet Union as the Cold War began. Ignoring Asia, he later saw America's close ally China fall to the anti-American Communists under Mao Zedong in 1949; the US and China fought each other to a draw during the undeclared Korean War, 1950–53. Truman fired his top general, Douglas MacArthur, during this conflict and saw his popularity plunge. As World War II ended, the massive problem of reconverting the 45% of the economy devoted to war production baffled Truman. Listening to liberal advisers, he refused to end extremely unpopular price controls, and was unable to stop a massive wave of strikes in major industries in 1945–46. Voter dissatisfaction to the Republican capture of Congress in 1946; with Senator Robert A. Taft as the conservative Republican spokesman, Congress repealed many of the wartime restrictions on business and lowered taxes. Taft rewrote the labor laws in the Taft-Hartley Act of 1947, balancing the rights of unions, management and the public interest; it became law over Truman's signature and remains in effect. Truman began with very high popularity ratings, but they plunged to the lowest on record. Democrats were unable to stop his renomination in 1948, but the far left nominated FDR's vice president Henry A. Wallace, and southern conservative Democrats nominated Dixiecrat J. Strom Thurmond. Observers almost unanimously expected victory for the Republican candidate, Governor Thomas E. Dewey, liberal from New York. Total astonishment greeted Truman's stunning election victory, as he reassembled the New Deal Coalition for the fifth consecutive victory, pulling in on his coattails a Democratic Congress. Although the Democrats organized Congress in 1949, the Conservative Coalition of Northern Republicans and Southern Democrats was in control, and Truman was to pass any of his liberal Fair Deal program. Nevertheless, he pursued civil rights through executive orders, especially a 1948 order to end racial discrimination in the military. Blacks remained in segregated units, but were to receive equal treatment. Truman's failures to deal with "Korea, Communism and Corruption" forced him to withdraw from reelection in 1952 and gave the Republicans an opportunity to crusade against him and elect Dwight D. Eisenhower in 1952. Overshadowed at first by his predecessor, Franklin D. Roosevelt, Truman established a reputation as a blunt, unsophisticated fighter for the common man, who took responsibility for his actions because, he said, "the buck stops here." His stunning reelection victory in 1948 baffled the experts and has inspired underdogs ever since. He is more popular in the present day, than he when he left office. His policy positions make him an icon for liberals. Truman was born on a farm near Lamar, in western Missouri, and grew up on a farm near Independence, Missouri. His grandparents had been Confederate sympathizers who had been rounded up by the Union army in the Civil War. After graduating from high school in Independence, with good skills in history and music, he decided against college and became a bank clerk in Kansas City. Always a joiner, he was active in the Missouri National Guard. From 1906 to 1917 he managed his father's 600-acre farm at Grandview, Missouri. During World War I his National Guard regiment was mobilized in 1917, he entered the Field Artillery School at Fort Sill, Oklahoma, sailing for France in 1917 as a lieutenant. Truman was soon promoted to captain in Battery D, 129 Field Artillery Battalion, 35th Division, A.E.F., and returned to the United States a major in 1919, after combat at St. Mihiel and in the Argonne offensive. He was in an artillery unit, and learned about gas warfare; he was never wounded, He married Elizabeth "Bess" Wallace on June 28, 1919; they had one daughter, Margaret, who married a New York Times editor. With an army buddy he invested his savings in a Kansas City haberdashery, but this venture was a failure. In 1922 Truman was elected a county judge; needing some legal knowledge he studied nights for two years at Kansas City Law School; it was his only education beyond high school, although he read history. In the 1924 GOP landslide he was defeated for reelection, but in 1926 he was returned to office as presiding judge of the court, the duties of which also involved administrative supervision of many county expenditures, including $60 million for public works; Truman put only Democrats from the Pendergast machine on the county payroll. In 1924, Truman paid $10 (equivalent to more than $120 today) as a membership fee to join the Ku Klux Klan, but withdrew when he learned that Pendergast, a Catholic, would not support anyone who belonged to an anti-Catholic organization; the Klan then campaigned against Truman. “ Boss Tom Prendergast: I've got a job for you. Harry S. Truman: Well, Jesus Christ and General Jackson. The answer's yes. In 1934 Pendergast arranged for Truman's nomination as United States Senator on the Democratic ticket; he was elected in the democratic landslide as a supporter of Roosevelt and the New deal. His first term in office was uneventful, except for a failed effort to prevent the renomination of Maurice Milligan for U.S. District Attorney for the Western District of Missouri; Milligan had obtained the conviction of 35 Pendergast "ward leaders" for vote frauds. He was re-elected in 1940 after a terrific battle against Lloyd Stark, Truman became nationally infamous as chairman of the "Truman Committee". Ostensibly for the purpose of investigating waste, fraud and inefficiency in government contracts, the committee allowed Truman and his associates to interfere in many aspects of Executive policy on the prosecution of the war. The committee frequently tampered with or even canceled contracts with legitimate suppliers of essential war materials when they would not deal with Truman's Kansas City patrons, the Pendergasts. Its formal name was the Senate Special Committee to Investigate the National Defense Program. Nevertheless, he was an energetic and forthright supporter of the New Deal and won widespread party favor for his attacks on business malfeasance in war production. He forced changes in the aircraft and ship construction programs, and worked well with other border state Democrats, especially Alben Barkley of Kentucky, the Majority Leader. In 1944, after Vice-President Henry A. Wallace had been rejected by leading Democrats as too far to the left, Truman supported his friend former senator James F. Byrnes of South Carolina for that office. Catholics vetoed Byrnes, who had left that faith. Truman himself became Roosevelt's choice as a compromise vice presidential candidate, and the two were elected. Roosevelt ignored Truman between the election in November 1944 and the inauguration in January; even as Vice president Truman was not consulted on national policies, and not informed of major decisions, nor of the atomic bomb. Although he realized Roosevelt's health was failing rapidly, he made no preparations for assuming the presidency and did not even build up a staff of advisors. Truman succeeded to the Presidency upon the death of FDR on April 12, 1945. President Truman pledged that in office he would carry on the liberal domestic policies of Roosevelt. He distrusted most of FDR's cabinet and set about to assemble his own team. During his term as President, he presided over the conclusion of World War II in both Europe and Japan. On April 25 his telephoned speech opened the San Francisco Conference establishing the United Nations. A week later Germany surrendered, and from July 17 to August 2, 1945, Truman attended the Potsdam Conference with Britain's Winston Churchill (soon replaced by the new prime minister Clement Attlee) and Joseph Stalin of the Soviet Union. In general, conservatives and liberals alike have applauded and supported the a-bomb decision because it shortened the war, and prevented hundreds of thousands or millions of casualties. The New Left or "revisionist" interpretation argues that the bomb was not necessary to end the war and that no invasion was necessary. They have no evidence to support that argument. They do have fragments of evidence that give weak support to the argument that one American goal was to intimidate the Soviet Union. The revisionists believe the US should have stayed friends with the Soviets, and that Truman was guilty of starting the Cold War (which they consider a bad thing). Morally the revisionists assume the USA was no better or worse than the Soviets—admitting to Soviet atrocities, they argue that socialism was morally superior to capitalism, which itself was a great evil the US intended to spread. In terms of the bomb, Secretary of State James Byrnes did make some offhand references to influencing Moscow, but his comments did not reflect the policy of the State Department or White House, and certainly not those of Stimson, who was by far the most important decision-maker. Vice President Truman had been kept uninformed about the atomic bomb; he had little interest in military affairs and his chief military aide, General Harry Vaughan, was a drinking buddy likewise unfamiliar with what was happening in the war. Truman, therefore, relied entirely on his Secretary of War, Henry Stimson. At Potsdam he approved the atomic bomb targets selected by Stimson and, on the way home, he authorized the bombing of Hiroshima, Japan, August 6, 1945, and Nagasaki three days later. The decision to drop the atomic bomb has been the focus of one of the most heated debates among both scholars and the public since 1945. After 1945 the debate was dominated by "traditionalist" scholars, who argued that the U.S. had no choice but to drop the bomb as a way to bring World War II to an end. The traditionalists were succeeded in the 1960s by "revisionists," who asserted that the dropping of the bomb was done to intimidate Stalin, not end the war. The leading revisionist historians emerged from the "New Left" movement of the 1960s and rejected any notion of the moral superiority of America or capitalism to the Soviet Union. They thought the Cold War and containment were poor policies and generally favored détente, along the lines proposed by Henry Wallace. They include Gar Alperovitz, Barton J. Bernstein, Kai Bird, Diane Shaver Clemens, Bruce Cumings, Richard Freeland, Lloyd Gardner, Gabriel Kolko, Walter LaFeber, Thomas Paterson, Harvard Sitkoff, Ronald Steel, Athan Theoharis, and William A. Williams (the leader of the "Wisconsin School"). The revisionists are not monolithic, but they usually agree that Truman and his advisers were wrong whether the issue is the Cold War, Korea, or the atomic bomb. Revisionists had argued that Truman's goal at Potsdam was to prevent Soviet entry into the war against Japan, and the atomic bomb was used to scare them off. However, in 1983 archivists discovered a letter Truman wrote to his wife from Potsdam on July 18, 1945: "I've gotten what I came for-- Stalin goes to war August 15 with no strings on it . . . I'll say that we'll end the war a year sooner now, and think of the kids who won't be killed! That's the important thing." In the 1990s, a more nuanced historical approach emerged searching for a middle ground, offering a number of more credible studies, essentially arguing that neither the traditional nor the revisionist interpretations were entirely satisfactory. The process of reconversion to peacetime was rocky. It was impossible to bring soldiers home fast enough, and they and their families protected loudly. All war contract were canceled, shutting down munitions plants and throwing millions of workers (many of them women) out of jobs, just as the 12 million service members were coming home. Truman sought to retain price controls against the vehement opposition of business but yielded somewhat in the face of bitter popular opposition. Large-scale strikes disrupted the economy, especially a coal miners strike and a threatened nationwide strike by railroad workers. He threatened to draft the railroad workers and the strike was called off; unions began to oppose him but he regained union support by his later attempts to veto or repeal the Taft-Hartley labor relations law. Truman's opposition to tax cuts, his insistence on price controls, and his lack of aggressive support of labor programs weakened his party. To voters frustrated with shortages and controls, Truman seemed indecisive and inconsistent; his efforts to deal with a postwar wave of strikes managed to alienate both organized labor and those who wanted more restraints on unions. Voters who normally supported liberal and labor candidates stayed home, resulting in a Republican landslide in 1946, giving the GOP a majority in both houses of Congress. Ohio Senator Robert A. Taft became the main GOP spokesman in Congress, tangling often with Truman. Gradually Truman created his own administration, using the Fair Deal label to express its goals in domestic affairs. Truman systematically removed the Roosevelt cabinet and inner circle of advisers. The most dramatic episode was firing Henry A. Wallace in 1946 because of his outspoken criticism of the administration's foreign policy as too harsh on the Soviet Union. Liberals saw themselves in a struggle with conservatives for Truman's soul after the 1946 election. Linked to the President through top aide Clark Clifford, these liberals included Oscar Ewing, former party official and director of the Federal Security Agency, Leon Keyserling, member of the President's Council of Economic Advisers, and David Morse, assistant secretary of labor. They embraced the memo plotting 1948 campaign strategy written by former Roosevelt adviser James Rowe, which urged Truman to "move to the left and focus on building a coalition of groups that centered on organized labor, liberals, and northern urban African Americans." Liberals had national support from the Americans for Democratic Action (ADA), led by Walter Reuther, Eleanor Roosevelt, Joseph Rauh, James Rowe, Reinhold Niebuhr, Arthur Schlesinger, Jr., Hubert Humphrey, and Ronald Reagan. The ADA was hostile to the Soviet Union, battled American Communists and fellow travelers like Wallace, and supported the purge of Communists from the CIO labor unions. Truman agreed with the ADA and moved left after 1946. However he could not tolerate Henry A. Wallace and the far left, which had considerable Communist support. When Wallace, then Secretary of Commerce, in 1946 denounced Truman's tough stand against Stalin, Truman fired Wallace. In 1947 Truman asked Congress for stand-by price controls, rationing, and bank and consumer credit control as parts of an anti-inflation program, but his ideas were ignored by the Republicans who controlled Congress. When railroad unions threatened to shut down the national transportation system in May 1948, Truman stopped them by threatening to seize the railroads and use the Army to move trains. In his state of the union message of Jan. 7, 1948, Truman called for rent control, increased social security benefits, universal military training, national health insurance, and other social legislation. The next week he again asked for passage of his anti-inflation measures. In February 1948 he asked for civil-rights legislation, including a federal anti-lynching law, a federal fair employment practices commission, a permanent civil rights commission, and abolition of the poll tax—measures that enraged many Southern Democrats. None of his proposals became law. More successful was Truman's drive to increase the efficiency of the executive branch; he appointed a commission headed by former President Herbert Hoover which recommended numerous changes, including unification of the armed services. Disgusted by violence against black veterans in the deep South, Truman called for the extension of the wartime FEPC program that called for fair employment practices, but Congress refused and it ended. He created the Presidential Commission on Civil Rights in 1946 by executive order (with no congressional approval needed); it recommended desegregation of local public facilities and the removal of restrictive covenants that prevented blacks and Jews from purchasing houses in restricted neighborhoods. The Commission generated attention but no action. Indeed, Congress refused to pass any civil rights legislation before 1957. Truman therefore decided to use his executive powers, and focused on guaranteeing equal opportunity in the military and the civil service. The Army and Navy operated segregated units, and refused to be part of a "social experiment" in integration. The Air Force, however, was much more willing. Between 1941 and 1951 it went from a segregated force to the first truly integrated service. Key generals became convinced that segregation was a drag on efficiency, and the Air Force decided to integrate in April 1948. before Truman issued his famous Executive Order 9981 on July 26, 1948, calling for equal opportunity in all the armed services. It allowed segregation but called for "equality of treatment and opportunity." In the face of opposition from some high-ranking officers, the Air Force moved cautiously, but by 1951 the last black unit was dissolved and the Air Force was completely integrated. Order 9981 created the Fahy Committee to implement the new policy. Truman's order did not actually integrate the Army—it used segregated units during the Korean War—but it opened the way for integration in the early 1950s. Public opinion was generally favorable except in the deep South (which voted against Truman in 1948). 1948 editorial cartoon shows farmer Truman trying to go down the middle while Wallace tells the Democratic donkey to Haw! (go left) and Thurmond tells it to Gee! (go right). As the presidential election of 1948 approached, no one thought Truman could be reelected. Truman's policies had alienated left right and center, but the party had no real alternative. Neither Roosevelt nor Truman had groomed a likely successor. Party leaders considered asking Dwight D. Eisenhower to run, but he refused. Liberals led by Hubert Humphrey of Minnesota inserted a strong civil rights plank in the platform, causing a walkout of the deep South. Truman was renominated by default, with Barkley as the vice-presidential candidate. Truman thrilled the convention by announcing his plan to call the Republican-controlled Congress back into special session to "ask them to pass the laws to halt rising prices, to meet the housing crisis--which they say they are for in their platform." When this special session accomplished little, as Truman expected, it gave the president a chance to attack the "Do Nothing" Congress. Both the left and right wings of the party split off and ran their own candidates. Henry Wallace, the candidate of the Progressive Party, was expected to divert labor, leftist and black votes, while J. Strom Thurmond was the "Dixiecrat" candidate whose supporters controlled the Democratic party in Alabama, Louisiana, Mississippi, and South Carolina. Truman exploited his multiple opponents, driving a wedge between the liberals and the Communists who controlled the Wallace movement, and holding the line in the outer South. Most of all he exploited the difference between the conservative Republicans who controlled Congress, and the liberal Republican candidate Tom Dewey. Truman crusaded against the Republicans as evil rich men, blasting them as fascists and denouncing the 80th Congress for its failure to help the average citizen. "Give 'em hell" fury delivered in 275 speeches over 21,928 train-miles had more impact that Truman's promises of more money for federal housing, higher social security and unemployment benefits, free medical care for everyone, the continued subsidy of farm prices, and a fair deal for minorities. The pollsters misjudged the election, as did all the traditional pundits. Truman rallied enough of the New Deal Coalition to win by 2.2 million votes, and carry in a Democratic Congress on his coattails. The key farm states of the farm states of Iowa, Wisconsin, and Ohio that Dewey had carried in 1944 now switched to Truman, giving a solid victory in the electoral college of 303 for Truman, 189 for Dewey, 39 for Thurmond, and none for Wallace. 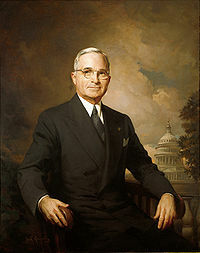 During Truman's second term as president, he pressed for civil rights legislation, compulsory national health insurance, and other domestic measures that he called his "Fair Deal" program. Almost nothing was passed by Congress, which was controlled by the Conservative Coalition. His seizure of the steel industry to prevent a strike was declared unconstitutional by the Supreme Court. Truman asked Congress for a great deal of liberal legislation, but got almost nothing. In foreign affairs, Truman brought in Dean Acheson as Secretary of State, and promoted the Point Four program of aid to underdeveloped countries. The policy of containing Communism was set into operation by the 1949 creation of the North Atlantic Treaty Organization (NATO) to oversee the integration of the military forces of its member nations in Western Europe and North America. A further step was taken in 1951 with the establishment of the Mutual Security Agency to coordinate U.S. economic, technical and military aid abroad. Truman won the farm vote in 1948 by charging the GOP shoved "a pitchfork in the farmer's back", but was unable to get new farm programs passed. His second secretary of agriculture, Charles F. Brannan promoted the Brannan Plan, intended to bring widespread changes to farm policy. Brannan proposed to replace market price supports with direct income payments to farmers. His plan set ceilings on the amount a farmer could receive and limited the program to farmers who did not exceed a set production mark. The Brannan Plan was supposed to foster the "family-sized farm" while providing affordable food for consumers. While Brannan could count on support from the left, especially the National Farmers Union (which was small), labor unions (which were powerful), and consumer groups (which were weak), he was opposed by leading farm economists and the national Farm Bureau (which was large) and the national Chamber of Commerce (representing business). The head of the Farm Bureau decried the plan as intrusive, a form of "creeping socialism," and expensive. The Farm Bureau, dominated by conservatives, resisted any curbs on full agricultural production. A bloc of Midwestern Republican and southern Democratic congressmen opposed replacing market mechanisms with outright government payments to farmers and setting limits on supports to individual farms. The Brannan Plan went nowhere and instead, the conservative farm bloc passed the Agricultural Act of 1949 with high price supports. Brannan justified his plan of direct assistance to small farmers, by reasserting the importance of the small family farmer as the foundation of American democracy. However, in the Grange small farmers opposed the plan because it too closely resembled welfare and would undermine their self-image as independent yeomen and successful entrepreneurs. Brannan sought to protect the small farmer against competition from the large companies, but the plan was not accepted by Congress because farmers self-image would not allow for welfare. In early 1947 the British government, which was socialist but anti-Communist, secretly told Washington its treasury was empty and it could no longer give military and economic aid to Greece or Turkey, requested the U.S. take over. Acheson convinced Truman to act quickly lest Greece be taken over by its communist partisans who were at the time strongly supported by the Soviet government working through the communist Bulgarian and Yugoslav governments. If Greece fell, Turkey would be helpless and soon the eastern Mediterranean would fall under Stalin’s control. In a dramatic message to Congress on March 12, 1947, President Truman said that the U. S. must take immediate and resolute action to support Greece and Turkey. The Republican Congress, after extensive hearings, approved this historic change in U. S. foreign policy in a bill signed May 22, 1947. Thus was born the “Truman Doctrine.” Greece suppressed the insurgents; both Greece and Turkey joined NATO. Truman usually followed the advice of the State Department in national security matters, largely ignoring the Pentagon and Congress. In the case of recognition of the independent state of Israel in 1948, however, he overruled the urgent pleas of the State Department and immediately recognized Israel. State had warned that recognition would anger the Arabs in the Middle East; Truman, however, was more responsive to domestic politics, where support for Israel was widespread. Truman, a Southern Baptist, sought religious allies in the Cold War. He tried to unite the world's religions in a spiritual crusade against communism, sending his personal representative to Pope Pius XII to coordinate not only with the Vatican but also with the heads of the Anglican, Lutheran, and Greek Orthodox churches. "If I can mobilize the people who believe in a moral world against the Bolshevik materialists," Truman wrote in 1947, "we can win this fight." Since the Roman Catholic Church was his strongest religious ally in the moral battle against international communism, Truman put Rome first in his global strategy, even trying to confer formal diplomatic recognition on the Vatican. At home, he received solid support from Catholics, who were a major element of the New Deal Coalition, but overwhelming resistance from Protestants, especially Southern Baptists who rejected anything "popish." Truman's political-diplomatic effort to formalize a public, faith-driven, ecumenical international campaign failed. Chiang Kai-shek, America's wartime ally and head of the Nationalist forces in China, was caught between two wars—a war on China by Japan and a war with Mao Zedong and the Chinese Communists. The U.S. policy was to avoid a civil war and to threaten to withhold additional aid to the Nationalists unless they worked out a compromise. No compromise was possible, and Truman refused to send in combat troops to fight the civil war. General George Marshall, who spent a year in China as Truman's emissary, testified that combat aid might have prevented a Communist victory, but General David Barr's military mission to China was specifically instructed not to supply this kind of assistance. General Albert C. Wedemeyer recommended this approach in his report on his 1947 fact-finding mission, but Marshall personally suppressed the report. Chiang believed that the Truman Doctrine to contain the spread of International Communism directed from Moscow would be extended to China, and ordered an offensive as soon as word of the new policy reached him. Wedemeyer warned that this would take place as soon as "they can be sure that the North Korean puppet government and its armed forces . . . are strong enough . . . to be relied upon to carry out Soviet objectives without the actual presence of Soviet troops." Truman had no knowledge or interest in foreign policy before becoming president, and depended on the State Department for foreign policy advice. Truman shifted from FDR's détente to containment as soon as Dean Acheson convinced him the Soviet Union was a long-term threat to American interests. They viewed communism as a secular, millennial religion that informed the Kremlin's worldview and actions and made it the chief threat to American security, liberty, and world peace. They rejected the moral equivalence of democratic and Communist governments and concluded that until the regime in Moscow changed only American and Allied strength could curb the Soviets. Following Acheson's advice, Truman in 1947 announced the Truman Doctrine of containing Communist expansion by furnishing military and economic American aid to Europe and Asia, and particularly to Greece and Turkey. He followed up with the Marshall Plan, which was enacted into law as the European Recovery Program (ERP) and led ultimately to NATO, the North Atlantic Alliance for military defense, signed in 1949. On May 14, 1948, Truman announced recognition of the new state of Israel, making the United States the first major power to do so. The Korean War began at the end of June 1950 when North Korea, a Communist country, invaded South Korea, which was under U.S. protection. Without consulting Congress Truman ordered General Douglas MacArthur to use all American forces to resist the invasion. Truman then received approval from the United Nations, which the Soviets were boycotting. UN forces managed to cling to a toehold in Korea, as the North Koreans outran their supply system. A counterattack at Inchon destroyed the invasion army, and the UN forces captured most of North Korea on their way to the Yalu River, Korea's northern border with China. Truman defined the war goal as rollback of Communism and reunification of the country under UN auspices. On January 12, 1950, Secretary of State Dean Acheson gave a speech to the National Press Club excluding South Korea from the defense perimeter, though Truman denies any wrongdoing on his behalf. Omar Bradley blamed Truman and Acheson in his memoir A General's Life, and historian Bill Shinn concurs. Acheson apologists cite the fact Stalin and North Korea already had contingency plans for invasion of the South; nonetheless Acheson's speech green-lighted a leftist takeover of a country most Americans never heard of, let alone were able to find on a map. Late in 1950 China intervened unexpectedly, drove the UN forces all the way back to South Korea. The fighting stabilized close to the original 38th parallel that had divided North and South. MacArthur wanted to continue the rollback strategy but Truman arrived at a new policy of containment, allowing North Korea to persist. Truman's dismissal of General Douglas MacArthur in April 1951 sparked a violent debate on U.S. Far Eastern policy, as Truman took the blame for a high-cost stalemate with 37,000 Americans killed and over 100,000 wounded. Truman fired his ineffective defense secretary Louis Johnson, and brought back George Marshall. The top-secret NSC-68 policy paper was the grounds for escalating the Cold War, especially in terms of spending on rearmament and building the hydrogen bomb. The integration of European defense was given new impetus by continued U.S. support of NATO, under the command of General Eisenhower. Truman committed the US to contain Communist expansion in Vietnam, where the Communists under Ho Chi Minh were trying to overthrow the French colonial regime. The State Department insisted that France give more autonomy to the Vietnamese. The US paid for about 80% of the French war costs. The problem was that the French were more interested in preserving their grandiose empire, and less interested in stopping Communism, while the US opposed colonial empires and saw Communism as the great threat to world peace and stability. Following NSC-68, Truman's last four budgets saw expenditures on national security quadruple from $13 billion in 1950 to $50 billion in 1953. On the political front, revelation of scandals in the Reconstruction Finance Corporation, in the Bureau of Internal Revenue and even the White House opened the administration to attack. Truman sought reelection in 1952 despite his dismal showing in the polls. He was defeated in the New Hampshire primary by Senator Estes Kefauver of Tennessee, and withdrew. Truman supported Illinois Governor Adlai Stevenson. Eisenhower won the GOP nomination and crusading against the Truman administration's failures regarding "Korea, Communism and Corruption," was elected in a landslide, ending 20 years of Democratic control of the presidency. Truman returned to his home in Independence, Missouri. He devoted himself to creating the Truman Library there; it was dedicated in July 1957 and is a part of the National Archives. With a staff of assistants, he wrote his memoirs in two well-received volumes, gave many interviews, and intervened occasionally in Democratic national politics on behalf of liberal candidates such as Adlai Stevenson. He died on December 26, 1972. Already by the 1960s, Truman had become a hero to liberals and Democrats, nostalgic over the successes of the New Deal Coalition that sputtered and collapsed in the 1960s. Even Republicans came to forget the nasty days and celebrated Truman as the hero of the underdogs and the man who rebuilt Europe through the Marshall Plan and stood up to Communism through NATO. Truman's reputation among scholars has gone from very low when he left office, to high after 1990. He is now widely considered to have been a tough-minded, decisive, and effective leader who ably guided the nation through the perilous waters of the early Cold War and whose policy of containment essentially laid the foundations for American "victory" in that prolonged conflict in 1989. For many historians, the down-to-earth Midwesterner now merits consideration as one of the greatest American presidents. In recent years presidential aspirants of both parties have claimed Truman as their own, especially if their election chances seem as hopeless as Truman's did in 1948. His reputation has been bolstered by scholarly biographies by Ferrell (1994), Hamby (1995), and especially McCullough's Pulitzer prize-winning popular biography (1992). The in-depth analysis by Leffler (1992), cautiously praised the Truman administration's essential wisdom in handling a myriad of problems. While Truman's public image was headed up, his reputation among scholars declined in the 1970s. Kirkendall concluded in 1974 that negative appraisals of Truman and his administration "may in fact have become the dominant interpretation, at least among the younger scholars." In terms of foreign policy a strong negative view comes from Offner (2002) who argues that Truman was a "parochial nationalist" whose "uncritical belief in the superiority of American values and political-economic interests," conviction that "the Soviet Union and Communism were the root cause of international strife," and "inability to comprehend Asian politics and nationalism" intensified the postwar conflict between the U.S. and the Soviet Union, precipitated the division of Europe, and set Sino-American relations on a path of long-term animosity. Rather than being a great statesman who carefully weighed various policy alternatives, Offner asserts that Truman's myopia "created a rigid framework in which the United States waged long-term, extremely costly global cold war". As his title suggests, the Cold War was at best a Pyrrhic victory for the United States. Truman became the model of the underdog who fights back and wins when the experts unanimously predict defeat. Gerald Ford, who had bitterly denounced Truman as a young Congressman proudly proclaimed the Missourian as his hero and conspicuously displayed a bust of Truman in the oval office after Ford became president in 1974. In the 1976 campaign both Ford and his Democratic rival, Jimmy Carter, outdid one another in claiming to be cast from the Truman mold. By 1980 when the Gallup Poll asked "Of all the Presidents we've ever had, who do you wish were President? ", Harry Truman finished an impressive third behind Kennedy and FDR. Fleming, Thomas J. Harry S. Truman, President (1993) for middle school audience. These are secondary source by scholars; unless noted they are generally liberal and supportive of Truman. Komarek de Luna, Phyllis. Public versus Private Power during the Truman Administration: A Study of Fair Deal Liberalism. Peter Lang, 1997. 253 pp. Leuchtenburg, William E. The White House Looks South: Franklin D. Roosevelt, Harry S. Truman, Lyndon B. Johnson. (2005). 668 pp. Thompson, Francis H. The Frustration of Politics: Truman, Congress, and the Loyalty Issue, 1945-1953. 1979. 246 pp. Merrill, Dennis. ed. Documentary History of the Truman Presidency, (1995- ) 35 volumes; available in some large academic libraries. Neal, Steve. ed. HST: Memories of the Truman Years. (2003)280pp; long excerpts from 20 oral history interviews (some of which are online at the Truman Library site). Geselbracht, Raymond. "Creating the Harry S. Truman Library: The First Fifty Years," Public Historian, 28 (Summer 2006), 37–78. ↑ His middle initial, S, does not stand for anything, but was chosen because his parents could not decide whether to name him for his grandfather Shippe or for his grandfather Solomon. ↑ Truman, Interview with David McCullough, C-Span Booknotes, July 19, 1992. Retrieved August 6, 2007. ↑ The Yalta Betrayal, Felix Wittmer, Claxton Printers, 1953, pg. 75. ↑ New York Times March 14, 1983. ↑ The memo until 1991 was mis-attributed to Clifford, who passed it along to Truman. ↑ Reagan was an energetic liberal supporter of Truman. He moved to the right in the late 1950s. ↑ Steven M. Gillon, Politics and Vision: the ADA and American Liberalism, 1947-1985 (1987). ↑ Alan L. Gropman, The Air Force Integrates, 1945-1964. (2nd ed 1998) online edition. ↑ Turkey did not have an insurrection, but it was such a bitter rival of Greece that it had to get money if Greece did. ↑ Pollak, Joel B. (May 14, 2017). Today in History: Harry Truman Defies State Department, Recognizes Israel. Breitbart News. Retrieved May 14, 2017. ↑ Military Situation in the Far East, Hearings before the Committee on Armed Services and the Committee on Foreign Relations, U.S. Senate, 82nd Congress (Washington, 1951), p. 558. ↑ Tang Tsou, America's Failure in China, 1941-1945, Chicago 1964, pg. 457. ↑ Richard C. Thornton, China: A Political History, 1917-1980, Boulder CO 1982, pg. 208. ↑ Hearings before the Senate Committee on Armed Services and Committee on Foreign Relations (also known as the MacArthur Inquiry), June 2, 1951. ↑ Hearings before the Senate Committee on Armed Services and Committee on Foreign Relations, June 6, 1951. ↑ Report of the Commission on Protecting and Reducing Government Secrecy. Senate Document 105-2. 103rd Congress. Washington, D.C. United States Government Printing Office. 1997. Chairman's Forward, pg. XL pdf. ↑ By 1946 he had two valuable aides Clark Clifford and George Elsey. ↑ Truman's wife accepted an expensive deep freeze appliance in 1945; with General Vaughan as the fixer, the donor was given special privileges in Europe. The Decision to Drop the Atomic Bomb, Truman Library. President Truman to Senator Richard B. Russell, August 9, 1945.